My first article about a famous Homestead Hebrew introduced Jack Skirball, the prominent philanthropist and son of the first Jewish merchant in Homestead. As you may recall, Jack attended Hebrew Union College to become a Reform rabbi. 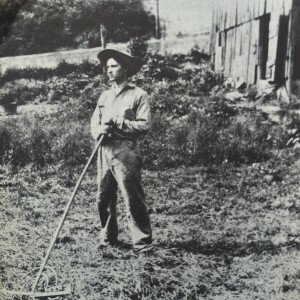 This article introduces another famous Homestead Hebrew… Jacob Rader Marcus (1896-1995), his classmate and life-long friend! In both articles the forgotten fathers are as important as the famous sons. Sections I and III below tell the story of Jacob’s father, Aaron Marcus (1868-1933). You’ll see he had quite a different experience as a merchant from Jack’s father. Their stories, taken together, delineate the range of possibilities for Jewish merchants trying to gain a foothold in these early years. Where the previous article could relate almost nothing about Jack’s truncated childhood in Homestead, Section II of this article fills in many details of life as a Jewish boy in turn-of-the-century Homestead. And Section IV, which concludes Marcus’ story, includes not only a list of accomplishments to kvell over, but also an unexpected way his monumental scholarship paved the way for projects like this one. 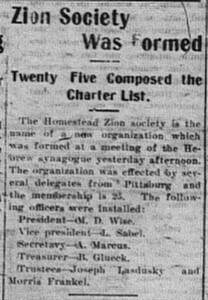 Homestead’s boom aligned with an auspicious time for its Jewish community, too, After a difficult start, the congregation was finally on an upswing, growing from a nadir of 10 members in 1897 to 20 in 1900. They had $1,000 in the treasury, resumed services and cheder, and planned to build. 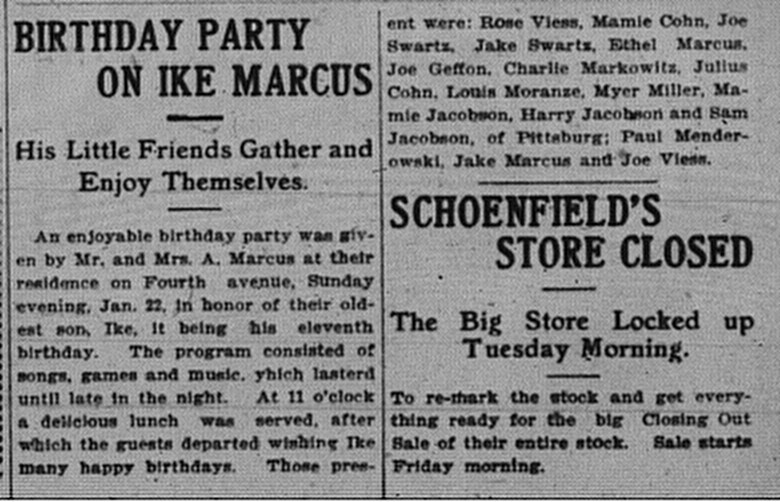 I would guess Aaron Marcus joined the shul soon after he arrived, as he purchased two seats in the new building the day they went on sale, December 2, 1901. 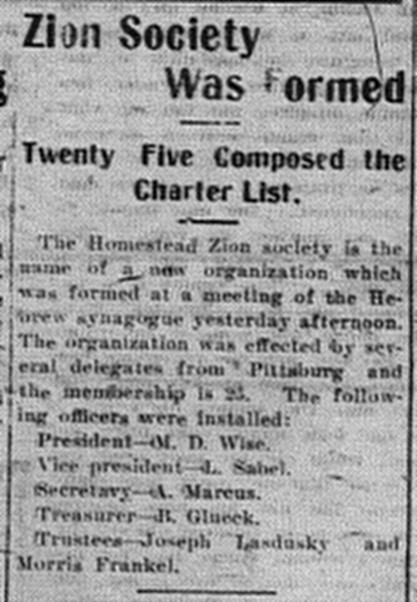 When the new synagogue was dedicated on March 31, 1902, he was one of its forty-three members named in the town’s paper. 4 Jacob was six at the time of the dedication; too young to remember or to have participated in the children’s choir, but perhaps old enough to have attended. Somewhere in this picture from 5/5/1905 is Ike Marcus. 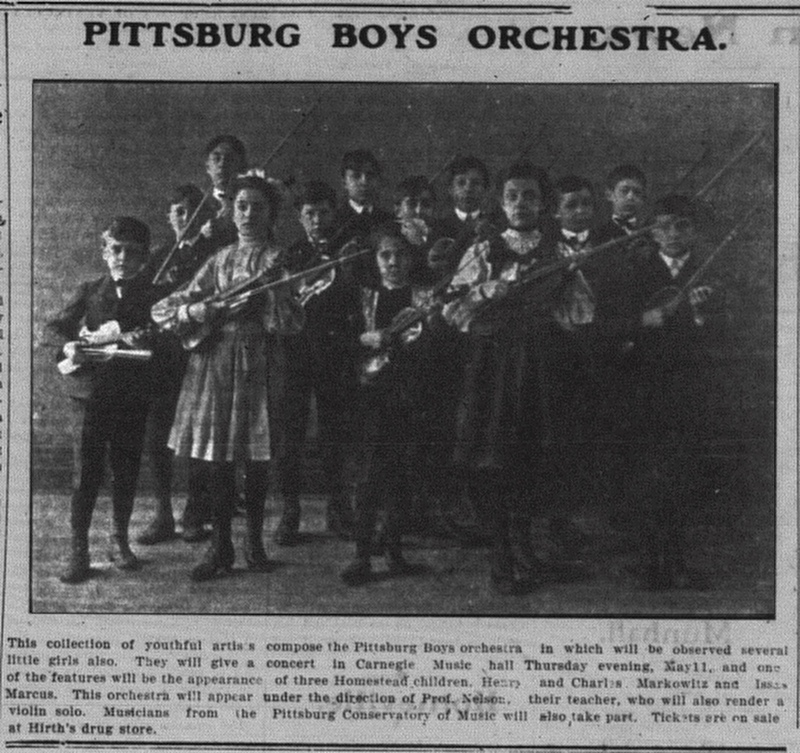 On 5/10/1905 the paper printed the full program for the concert. Both Isaac Marcus and Henry Markowitz had violin solos! All three Homestead boys named were in the Jewish community. 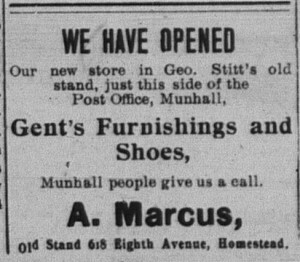 Alas, after all this exciting press, only once more did the paper mention Aaron Marcus — to alert the town of his departure, On April 5, 1906 came the sad news that, “A. 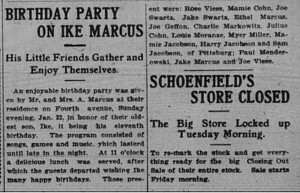 Marcus, a former Eighth avenue merchant, moved his family to South Side, Pittsburg, today, where he will go into business.” On August 9, 1906 he sold his synagogue seats back to the congregation for $114.80. 6 And thus ended Aaron Marcus’ ties to Homestead. His timing could not have been worse. Around seven o’clock, six o’clock when it got dark in the winter, we observed services. In other words, the children formed a minyan — of course, they were less than thirteen — and they read the prayers for the evening prayer….This was done in the school, in the vestry room, which was called the cellar. As far as I know all the Jews in the community — and they were more or less of East European stock if you include Hungarians — they were all observant. In a little town like that, you can’t stand out. We were all, everybody was observant…There must have been [a kosher butcher] in Homestead…because we always had kosher meat. Everybody was Orthodox. A number were Litvaks; some were Hungarians. It was a mixed group, but they got along very well, as far as I know. Some were a little better dressed than the others. I can recall a woman, a Hungarian, more or less of a peasant type, but a Jewish woman, force feeding a goose. That’s European. They force-feed them, then they have a very rich liver. Everybody was open Saturdays. Nobody was closed on Saturday, nobody. We were all merchants, we were all open on Saturday. That was a big day: the workmen got paid from the mills, and they came in and patronized the Jews. I’m pretty sure at Rosh Hashanah and Yom Kippur they were all closed. There was a lot of social control, and nobody would dare be open as far as I know (I think I would recall). …Everybody was more or less prosperous. There were no poor people as far as I know in the Jewish community…We knew we were a Jewish Orthodox community. The German-speaking Hungarians stuck out in Marcus’ memories, but as Litvaks, his family were amongst the majority Yiddish speakers. His father read Yiddish papers like the Folḳsfreynd (People’s Friend) from Pittsburgh and the Morgan Journal (Jewish Morning Journal). “He wouldn’t dream of reading the Forward. He despised socialism, and he voted the Republican ticket,” Marcus recalled. Odd as it might seem, most of the Homestead Jews were Republicans then. The father of one of the families he remembered, Morris Frankel, was a local Republican politician at the time Marcus was there. Other families he remembered included the “Lasduskys, Glicks, Grosses, Heepses (sic)” and “M.D. Weis, Moshe Dovid Weis, a Hungarian from McKeesport,” whom he singled out as “one man who was possibly learned…a man of some Jewish culture.” 11 His father knew Hebrew well enough to read stories from the prophets to him. And, as the earlier newspaper clipping indicated, he was active in the Zionist movement. Among the East European immigrants — this applies generally — nobody paid any attention to the children. They were totally ignored, and they grew up by themselves for better or for worse. There was no concept of rearing children. You had to know the blessings. If you were bad you got a smack. Physical punishment was frequent, frequently also severe. In other words, the mores and traditions and customs of Europe were brought over here, at least I assume they were. Spare the rod and spoil the child. …Neither of my parents believed in sparing the rod until we started to grow up, and I was punished severely at times even as late as my thirteenth year. That same year I was beaten pretty badly by my father, though I never held it against him. I was devoted to my father. But that generation, it was a generation also of not poverty, but hard times, panics. It was before the Federal Reserve could control panics. And my father had a lot of financial troubles, a lot of troubles. And he was a very unhappy man, though he was devoted to me and devoted to his children, but when you’re unhappy you take it out, and you whip and hit people. It was a hard life. These immigrants had a tough life, don’t you ever believe otherwise. There may have been some homes, and I think there were some where there was no violence, where the parents were more cultured and didn’t raise their hands against the children. My home was not that type of home. Jacob had to contribute, too. He worked for his father starting when he was about eight, and by the time he was a teenager, he could run the store on his own. In Bright Eminence: The Life and Thought of Jacob Rader Marcus, one of the stories the author retells gives particular insight into all that Marcus had to master at a young age. 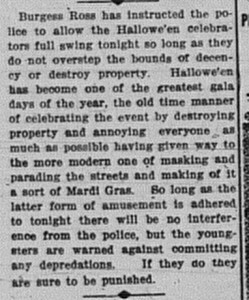 10/31/1905: The town’s burgess warned youngsters “against committing any depredations” on Halloween as in “the old time manner of celebrating the event by destroying property and annoying everyone as much as possible.” Click to enlarge. …And I recall one particular event, it was Halloween night…and I had a false face of a devil. I came home about eleven o’clock, ten at night. The maid was sleeping in the kitchen, probably had a cot. When she saw me she starts screaming in Polish, “The devil!” And my mother came home then, tired, frustrated, working hard, Saturday was the big day in the store, and she gave me a severe beating. Fourth of July everybody went almost berserk. They went to my father’s store or one of the other stores and bought a nickel plated revolver for three or four dollars. 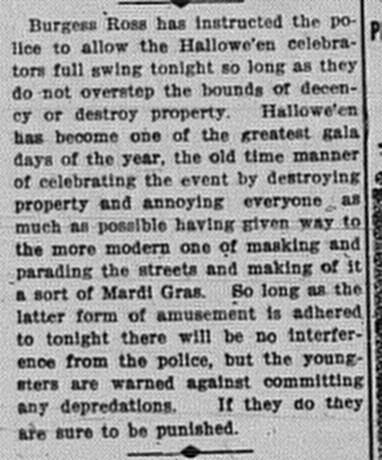 Bear in mind this was almost a hundred years ago [from 1994]. I’m in my upper-nineties. And they got ammunition, blanks, and walked up and down the street on the Fourth of July strictly at night, shooting up with their cheap revolvers. Not the Jewish community, the goyim, the Gentiles. Poverty and lawless led to all kinds of stories like these. I came home walking from school when I was about seven years of age, and there was a peddler. (In those days bakers peddled their goods.) I saw a pie. We didn’t have pie at home — pie isn’t a Yiddish esnvarg [food] — so I stole a pie. The baker saw me, chased me home, and my mother had to pay for the pie. A huge pie, five cents. Then I also ran with some Gentile kids, and they would steal soap from the boarding houses, where the Slavs were boarding. They would steal soap because they were so impoverished that they couldn’t afford to buy soap, and I’d run with them. We were in a gang. …There was also an Irish gang in town of young men — boys, rather. When we [he and his brother] would try to sell newspapers on a Sunday, they took our papers away from us. They controlled the newspaper business. We were out of business. And when…I was seven years of age , my father gave me a batch of buttons, campaign buttons. Theodore Roosevelt and a man named Fairbanks were running for office, national office, and I sold all my campaign buttons. And when I came home and wanted to give my father the money (I sold them mostly in saloons)…, I reached in my pocket. My purse was gone. My purse had been picked in saloons by professional pick-pockets. 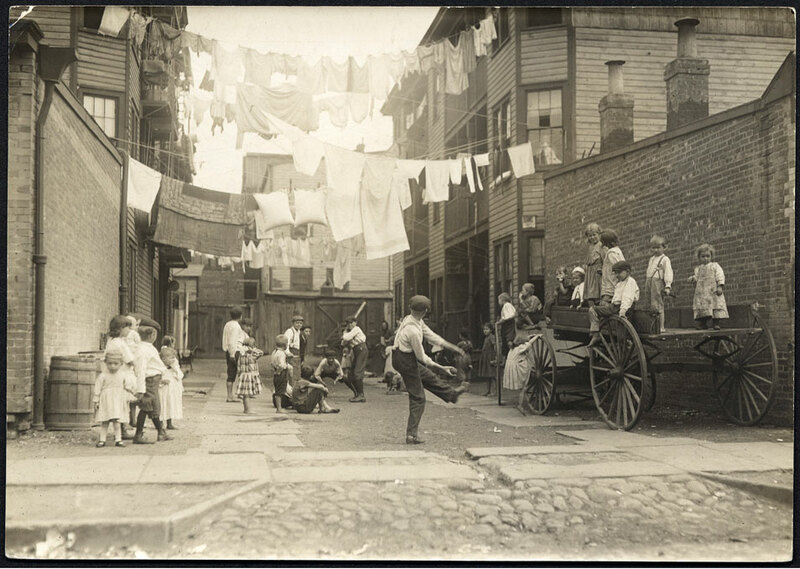 …I was very streetwise and some of these people with whom I ran, kids, also seven, eight years of age, not only stole soap from the boarding houses, would go into a drug store, and there was some candies exposed, chewing gum and other things, and we’d steal those. were all Gentiles, Gentiles from humble homes. Proletarian mill workers and the like. Sat at the bottom of the heap. We looked upon them as superiors, because we were the children of immigrants. We were humble. And we thought that they were Jesus H. Christ…Everything was relative. But as we were growing up, and the children of immigrants, we stopped at the native Americans, who were very superior, elite, and our superiors, whatever that meant. [In school] everybody was a foreigner. The school we attended were mostly Slavs and Poles…I lived in a tight little community among Jews and Slavs and Poles. And these Poles, when I knew them, they didn’t have any kids, there were a lot of unmarried ones, and I had no Polish associates. I associated only with Jews in Homestead. In school I had no Gentile friends. It may seem from all these stories that Homestead brought out the worst in its children, but as you’ll soon see, it provided one other influence that would make all the difference for young Jacob. Jacob’s memories of Homestead seem a touch rosy to me. When he repeats that everyone was prosperous and there wasn’t any anti-Semitism, even when he downplays painful incidents like his parents’ punishments, I can’t help but think that whatever the difficulties that befell Jacob during his first eleven years, time would prove them to be much less painful than the years that followed. Jacob was always honest about what came next for his family. 1900 to 1906 the mills were going full blast. People were well paid. They worked twelve hours a day for a dollar. And my father made some money, and everybody was more or less prosperous. …Conditions began to be bad in Homestead, we were not making any money, and father was eager to improve himself, so around 1906 or ’07, I do not know when, probably ’07 he moved out of Homestead, went to Birmingham at the Southside of Pittsburgh, on the other side of the Monongahela, and he opened a small little department store. And within a year or so he was bankrupt. He moved out to West Virginia hoping to improve his lot…And he went from the frying pan to the fire. And he suffered for years and years until World War One broke out. Then we couldn’t make a living in Wheeling. We moved out into the mountains where there were no Jews in a village. There my father made enough money to retire on. In the mountains where business, at least, was better, they were the only Jewish family for miles around. At this point, though, any loneliness or discomfort was his parents’ and siblings’. At fifteen Jacob left home. 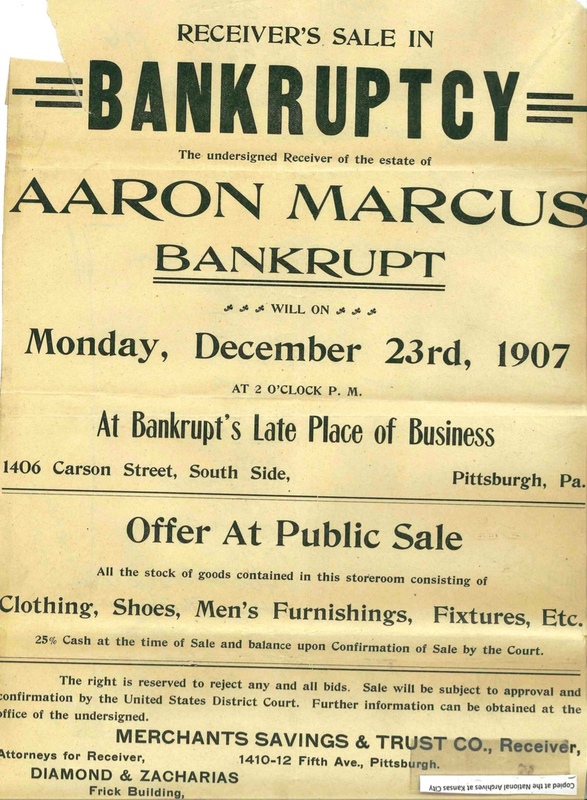 Before returning to Jacob’s story, I would like to look more closely at Aaron’s 1907 bankruptcy. It’s useful for us that he failed in this way. Just as Jacob’s oral histories leave behind a unique record of childhood in Homestead, Aaron’s bankruptcy fills in missing details about life as a small-time clothing merchant… because bankruptcy is a legal proceeding that leaves behind a paper trail that persists to this very day. 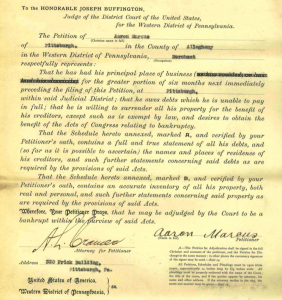 I picked up the trail at the National Archives in Philadelphia, where archivist Patrick Connelly confirmed for me that Aaron Marcus’ name appears in the Bankruptcy Act of 1898 Index. Bankruptcy has formal steps. No one ends up whole, but the bankrupt isn’t permanently broken, either. 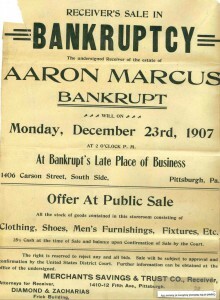 For Aaron Marcus the process began on November 21, 1907 when he declared bankruptcy. The petition he filed with the court includes the standard “Statement of all Debts of Bankrupt,” which records that he owed two months of rent ($140) for his store and $10,270.15 for merchandise purchased from 76 different suppliers across 13 different states. Aaron Marcus had what was probably a very typical men’s and boy’s clothing, furnishing, and shoe business, so examining his creditors (complete list here in PDF form) gives a sense of the vast reach of suppliers connected to even the meanest of operations. Against his debts he claimed $5000 “stock in trade.” Surprisingly, he did not indicate that anyone owed him money. (Another bankruptcy petition I read from this period reads like a who’s-who of unemployed, immigrant steelworkers who bought on credit.) He also did not indicate owning any real estate or personal property (other such petitions list things like house furnishings or watches). We learn even more about Marcus’ shop from the report filed in early December by the court-appointed appraisers who valued his goods and store fixtures at $2650.57, about half what Marcus claimed. The inventory (complete report here in PDF form) lists exactly what Marcus’ store had been selling, all the different kinds of garments and accessories that an average man or boy might wear in that day. As his was the kind of small business that almost never left behind records, these court-mandated inventories give unique insight into aspects of their operation. Over two auctions in late December, Marcus’ goods and fixtures were sold to the highest bidder. The first auction, won by David L. Markelson, was not accepted by the referee after unspecified “exceptions were filed.” The second auction, which netted $2025, was accepted. Between the two auctions, the next phase of the bankruptcy proceedings began. Marcus’ creditors met in downtown Pittsburgh and appointed a trustee to represent them. And here is where things begin to get interesting. A hearing was held on January 18, 1908, in which the trustee and two other men representing the creditors questioned Marcus about the events leading to his bankruptcy. Transcripts of these hearings don’t always appear in the bankruptcy records, so we’re very fortunate to be able to hear from Marcus’ own mouth how he went under (and even to learn surprising twists along the way, such as his investments in real estate, which were a winning strategy for other Homestead business men). Q You were in pretty bad shape during the summer? Q And it didn’t get any better during the fall? A I was expecting it to get better. After July business is over. Q As a matter of fact, it got worse in the fall? Q You owed more than you had in stock? Q That same condition existed up until you went into bankruptcy? A Whatever I took in I paid out…I paid off as much as I could. Q You were unable to pay your debts? A I was expecting business for fall. After July there is no business. July and August there is nothing doing. Q When did you first find out you were insolvent? A When the creditors started to push me. They didn’t give me a chance. A About a week or two before they closed me up. Q You knew, Mr. Marcus, that you were insolvent away back in June? A If I had had a good season I could have paid up a lot of creditors. Q You owed about $10,000 according to your schedules. Did you expect to pay that off? A Yes, if I had had a chance. If they would not bother me. Q As a matter of fact you knew in the fall that you were insolvent? You can hear the despair and denial in his insistence that he could have made it. The emotion may be honest, but overall it’s hard to know how reliable his testimony is. He was evasive on almost every point, from the details of when and how he sold his real estate, a $1700 check his former clerk claimed he wrote shortly before declaring bankruptcy, the timing of particular large purchases of goods, and most intriguingly, the itinerant jobbers to whom he sold his goods wholesale in the months before declaring bankruptcy. Somehow it was the examiner who was able to provide specific names and dates and amounts. About one, he asked, “Did you make any arrangement with him to store any of your goods, or to take some of your goods so that you would be able to defraud your creditors?” And more pointedly, “Was there any goods that you had over in the South Side store originally that were taken out and put in storage or in possession of some other person that was not accounted for in the inventory made of the goods on the premises?” Again and again there were questions about how he allegedly disposed of his stock in the four months before the bankruptcy…. and about the involvement of his brother… the same David L. Markelson whose attempt to buy the goods at the first auction was blocked! Despite all these concerns, the bankruptcy proceedings moved towards completion. On February 10th an “Order of Distribution” was filed with the court, laying out how the creditors would be reimbursed at a rate of 5%. And that would have been it, except for a freak occurrence: a robbery reported Sunday morning, February 16, in a storage space on the Southside…rented by David L. Markelson… containing goods that had previously belonged to Aaron Marcus! 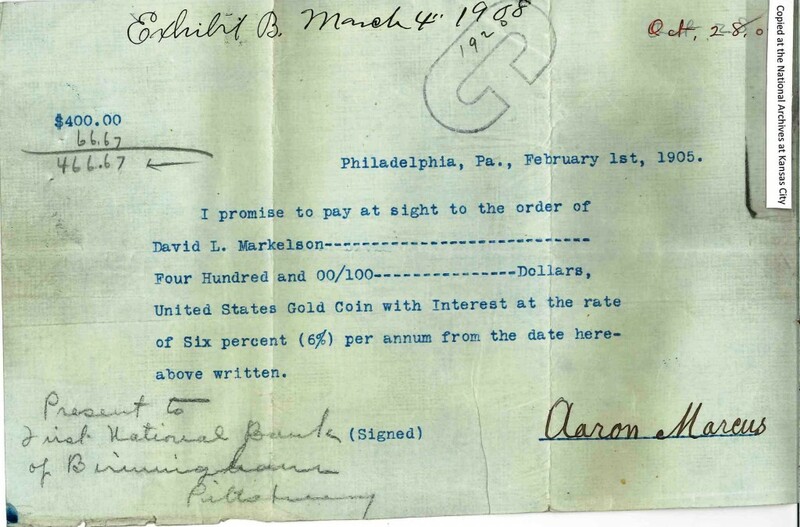 The main issue at stake was the timing and circumstances under which Markelson received each set of goods. Despite all the suspicions raised, the trustee, Marcus, and Markelson eventually agreed that $2437.50 worth of goods had been transferred more than four months before the bankruptcy, and on March 14 the referee decided that the remaining $1428 transferred sooner had to be auctioned to pay off Marcus’ debts. The auction took place on April 6 and netted just $235. The creditors were paid off July 1st at a rate of 3.56%. And then the matter was truly at an end. 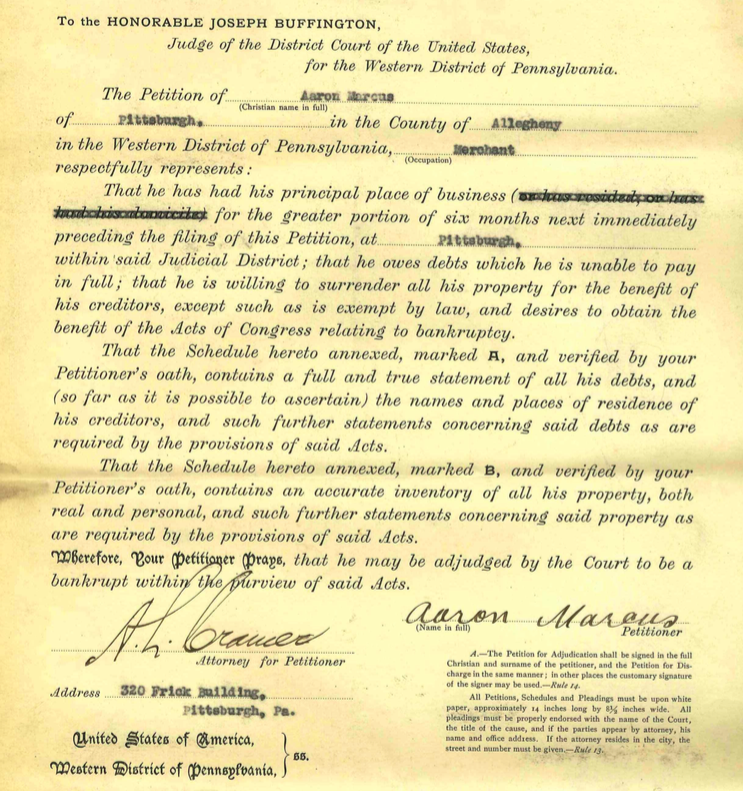 On September 25, 1908, Aaron Marcus exited bankruptcy and soon after moved to Wheeling for a fresh start. David joined him as his clerk for a year or so. He never returned to Russia. Aaron Marcus’ story is his own. He tried hard. He had hope. He saw the path forward, but lacked the luck and skill to make it. Nevertheless, it’s tempting to mine his experience for insight into the many other turn-of-the-century Jewish merchants like him. Though most fared better, they all faced the same risks and depended on each other for loans and credit. As a grown man, his son would acquire a unique perspective into why his father’s sad story is worth examining a century later. I must have stopped when I was about, oh, nine, let me figure now, let’s say about 1906. I was nine or ten years of age. By that time my whole life had been changed. My father bought me a membership in the Carnegie Public Library. That was one of the first libraries that Carnegie built. And then I began to read, and by the time I was, let’s see 1906 I was ten years of age, I had read dozens of books by an English writer called George Henty. You see my genes had begun to make themselves known, and I was a voracious reader, and my whole life has been dominated by that because I read history books, and when I began to move forward in life and make a career, I have made it as a historian. In Wheeling a local rabbi took an interest in him and pushed him to go to Hebrew Union College for high school and college. While Aaron Marcus was displeased at the prospect of his son’s becoming a Reform rabbi, Aaron’s store was not doing well enough to provide a future for Jacob, and Jacob wanted nothing more to do with the uncertain world of business. He left home for HUC at the age of 15, crying most of the way to Cincinnati. He lived in boarding houses while there. I cannot resist sharing this anecdote from when one of his fellow roomers purloined a gun from the landlady’s policeman son and waved it around. If Jack Skirball had spent more of his childhood in Homestead, perhaps he would have had stronger nerves, too! Marcus was ultimately successful at HUC, though it took much effort to overcome the limitations of his earlier education. 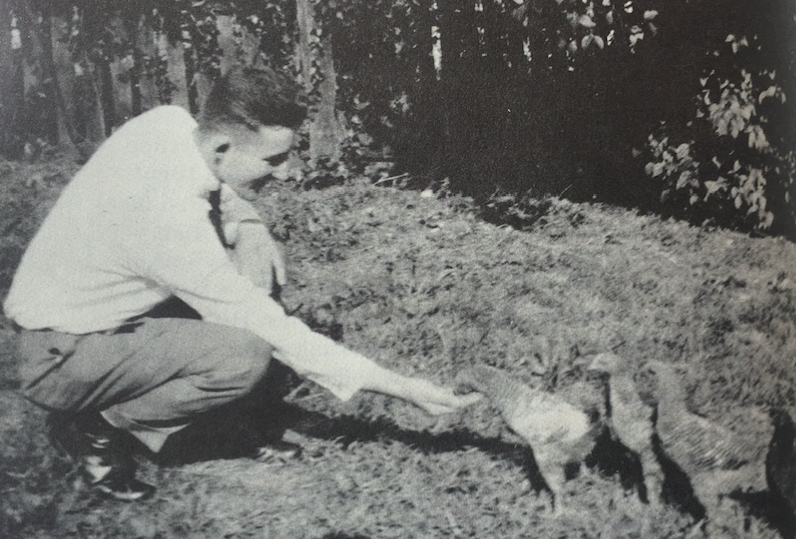 He was ordained after WWI, but instead of pursuing a pulpit, he began to teach there. He took a leave of absence to earn his PhD in Europe, and upon his return he resumed teaching at HUC and never left. According to Dr. Uri Herscher, after Skirball became financially successful, he help support Marcus’ scholarship. All of that scholarship was in the new field of American Jewish history, which became Marcus’ focus within a few years of his return to the U.S. The website of the American Jewish Archives, which he founded in 1947, explains how. 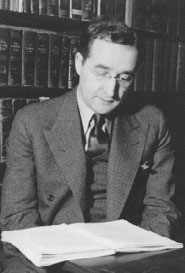 Throughout the 1930s, Marcus collected source material and urged his students to write papers in the field of American Jewish history; in 1942, celebrated as the 450th anniversary of the discovery of America, he offered what he later described as “the first required graduate course in an academic institution in American Jewish history.” The 1940s saw other scholars, too, strengthen their interest in American Jewish history…What set Marcus apart was that he knew more than the others did, having come to the field earlier, and he alone decided in the 1940s to devote his full attention to American Jewish history. 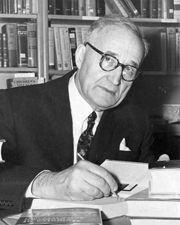 The website goes on to relate how he “worked systematically to establish American Jewish history as a scholarly discipline.” Those details I’ll leave to the various articles enumerating his achievements, such as this 1958 article written on the tenth anniversary of the archive he founded and this 1997 article by fellow American Jewish historian Jonathan Sarna. Instead, I’ll conclude by focusing on one small work amongst his more than 300 books and articles on the history of American Jews. I did not discover How to Write the History of an American Jewish Community ’til long after I began this project, but it is, indeed, the missing instruction manual I wish I had had all along. I can’t get over the coincidence that the manual was written by a scholar from the very town I’m researching. Marcus in his later years. Yes, Marcus wrote the manual on what records to collect and how to find them — particularly pointing out the value of personal interviews and court records — but the person I hear in both of his oral histories is just another man telling old stories with a lack of self-awareness in finding himself on the receiving end of people putting his own ideas into practice. And here I am, a Heeps!, poking around to find the larger meaning in his favorite childhood stories and his father’s worst setbacks. While he, more than anyone, would understand what I’m up to, I still can’t help but think he’d be amused by all the fuss I’ve made over one father and one son who tried to find their way in a once-booming milltown. In Pittsburgh Aaron went to work in a small machine shop where he developed a good relationship with his boss, George Westinghouse, one of the founders of what was later to become a great industry. One day the boss came to Aaron and told him that he, Aaron, was going to quit. Marcus, frightened, asked Westinghouse why he was firing him. Westinghouse replied that the was not firing him, but that Marcus, being a Jew, would soon open his own clothing store! Eventually the prophecy came true. When Westinghouse had to close his shop for a time because he had fallen victim to the terrible financial panic of 1893, Marcus found another job in the Carnegie Steel Mills. He was discharged from that job when, trying to advance himself, he experimented with the operation of an overhead crane, which he almost destroyed. Although there is evidence of social and family visits amongst all these communities, I don’t think of it as contradicting him so much as for situating his memories within the range of experiences different people had at that time. Tammy, your research continues to turn up interesting stories and relationships. Thanks for this one about Jacob Marcus. Fun to discover how far and wide the “children” of Homestead have traveled. Fascinating stories, with some similarities to my own family’s stories and some differences. And amazing how Jacob Marcus “wrote the book,” literally, for what you are doing! Very interesting, Tammy! This takes me back to my grandparents Yitzhak and Esther Grossman’s era in Homestead and the hard times he experienced in his store there. Thanks. Nice to be updated by you on this 4th of July. Your accounts of the lives and times of these Western Pennsylvania Jews are so fascinating to read and you tell these stories so well. My grandfather Jos. 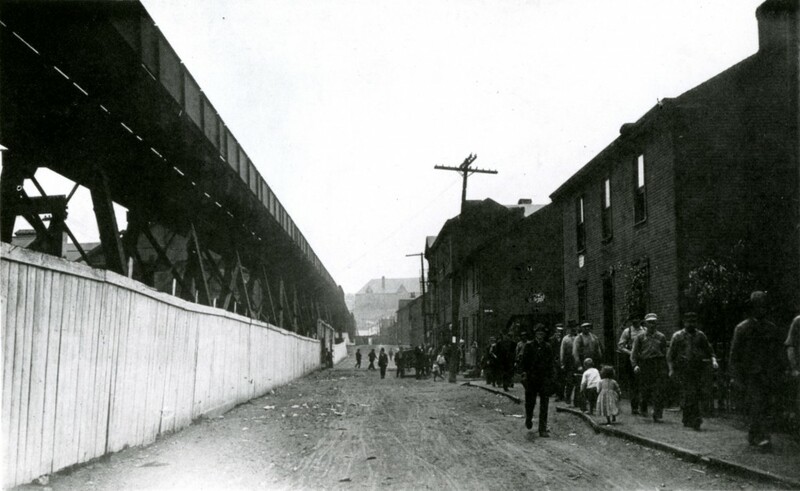 Meyers , while conducting his furniture trade in McKeesport, struggled to pay his creditors (his ledger books document pages of unpaid credit provided by him to the townsfolk) prior to relocating his family and business in Manasquan, NJ. Many anecdotes you share parallel the oral histories I find so fascinating . Looking forward to the next edition . Somehow my initial comments did not seem to make it to you. 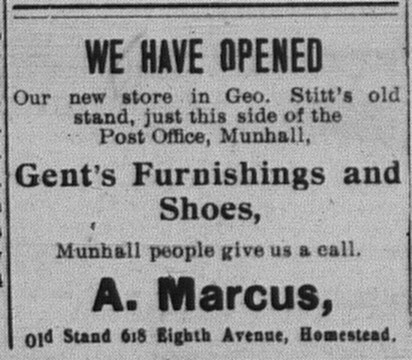 Briefly, I have for sometime thought that growing up in the sort of diverse and non-affluent society such as Munhall/Homestead provided was helpful for Jacob Marcus and probably for a lot of us who have read this column. Second, I have not heard or read the word “hunky” in quite a long time, but I do remember that many of Eastern European descent calling each other that name, most often with pride. Lastly, I especially liked the view up to the Homestead Carnegie Library from City Farm Lane. That was the location of the “Hole in the Wall” entrance to the steel mill. Just to the right of that view on Eigth Avenue was our family’s Sarons Drug Store, and to the right of that view on Ninth Avenue, I grew up. As for the library, I spent many hours there, taking out books, attending plays, and learning to swim! Thanks for doing this, Tammy. Jacob was my Uncle. My family would journey every year to celebrate Passover. They were fabulous! I loved him very much and miss him terribly.